The Dragon War, the fantasy trilogy beginning with A Legacy of Light, continues with a tale of blood, shadow, and dragonfire. Civil war rages. Brothers fight against sisters, friends against friends, sons against fathers. 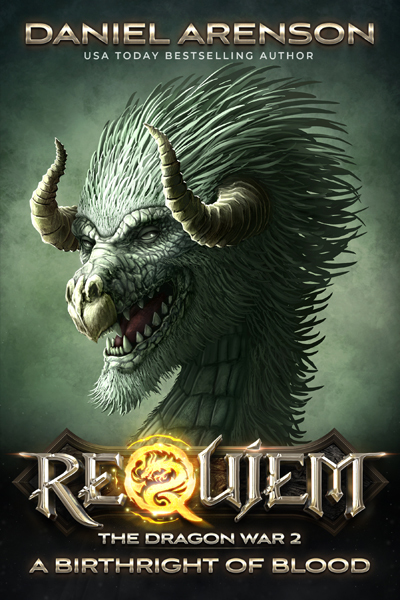 Requiem, an ancient kingdom whose people can become dragons, is tearing apart. The Cadigus family, usurpers of the throne, muster their greatest army yet. The Resistance, a small band of rebels, seeks new allies and new hope. For years, these two forces have fought in shadowy forests, forgotten ruins, and dark alleys. Now they fly to open war. The kingdom bleeds. The sky rains fire. The crows feast. Heir to the fallen dynasty, Rune was thrust into the uprising. He bears the torch of Requiem, a birthright of blood and fire. Yet when the hosts of Cadigus fly against him, an army that outnumbers his own ten to one, can Rune save the land of his fathers?